Archaeologists have clashed with road developers in the UK over claims that engineers accidentally punctured a large hole through a 6,000-year-old structure near Stonehenge, potentially destroying prehistoric artifacts and evidence of now-extinct "monster cows." The drilling is alleged to have taken place through a man-made Mesolithic chalk platform at Blick Mead -- a tepid spring at the edge of the Salisbury Plain -- where archaeological excavations have been ongoing since 2005. Archaeologists are concerned that further drilling, which is part of a $2 billion scheme to build a tunnel under the ancient site, will cause the water table to drop, potentially destroying key artifacts which have been preserved in the water-logged ground. "This is a travesty," Professor David Jacques from the University of Buckingham said in a statement. "If the tunnel goes ahead the water table will drop and all the organic remains will be destroyed." Archaeologists are concerned further drilling could destroy a preserved hoof print of an auroch, an extinct prehistoric cattle. One auroch provided food for 300 people. Among these is the hoof print of an auroch, an extinct prehistoric cattle. "We took great care to excavate this platform and the aurochs' hoofprints," Jacques said. 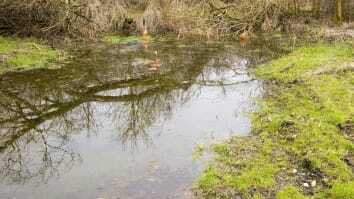 "We believe hunters considered this area to be a sacred place even before Stonehenge. 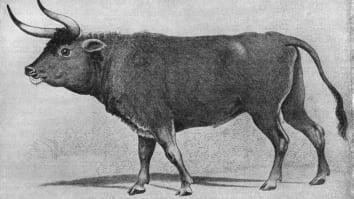 These monster cows -- double the size of normal cattle -- provided food for 300 people, so were revered." Thousands of flint tools and bones of extinct animals eaten during prehistoric feasts were also uncovered at the site, according to researchers. The site is believed to be the earliest known inhabited settlement following the last Ice Age, dating back 12,000 years. It is also deemed to be highly important as it is where the hunter gatherers who once roamed Britain first encountered Neolithic farmers who went to build Stonehenge, researchers said. 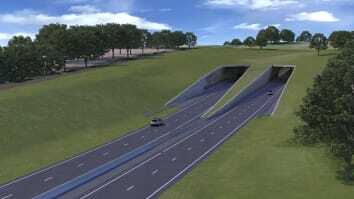 The road developers are planning to build a 1.8-mile tunnel near Stonehenge in a bid to hide the busy highway. "It may be that there are footprints here which would be the earliest tangible signs of life at Stonehenge," Jacques concluded. "If the remains aren't preserved, we may never be able to understand why Stonehenge was built." Archaeologists say engineers dug a 10-foot borehole through the chalk platform, which is believed to be constructed from flint and animal bones, without consulting the researchers. Kate Fielden, honorary secretary of Stonehenge Alliance, told CNN that she is also concerned about the development, and warned that it could "irreparably damage" one of the world's most famous heritage sites. Highways England nevertheless stated that their installation of a piezometer -- a device used to measure pressure and depth of groundwater in boreholes -- had resulted in no archaeological damage. "No damage has been caused to archaeological layers," a Highways England spokesperson told CNN in an email. "We notified Professor David Jacques of the locations of our water table monitoring, and have adhered to guidelines in carrying out the work. We have also kept Professor Jacques informed and we will be meeting him today." The spokesperson said that the work will have no significant effects on the Blick Mead area. "The works have been undertaken in a highly professional manner, with an archaeologist on site and with due care being exercised at all times," they continued.